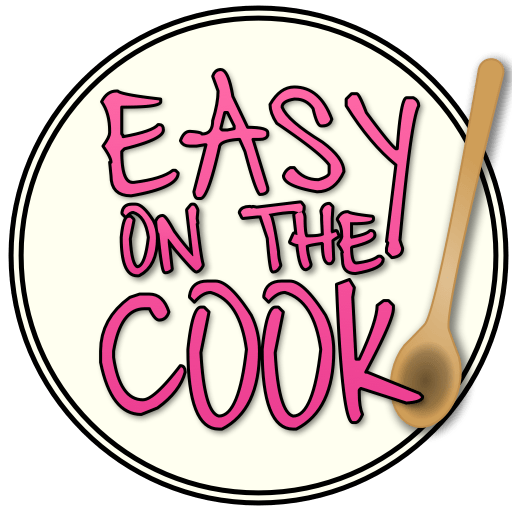 How to make a Barbie Cake – It’s easier than you think! I am here to tell you Barbie Cakes don’t have to be complicated. I will have to admit that the first time I made a Barbie cake (and remember this was long before I had children) I took all weekend to bake a perfect cake from scratch, made 3 colors of frosting and spent at least 6 hours piping, swirling, and making rosettes all over her ball gown. It was beautiful, but man, no one in the real world has all weekend to work on a Barbie cake! Over the years I have simplified the process. When I made this one it took about 1.5 hours to decorate, but remember I was stopping to take pictures so I could share my simplified process. I promise you don’t have to be an expert to make this cake look fabulous. Use a full sized Barbie. I know at the cake stores you can buy Barbie’s torso so you don’t have to make such a big cake skirt, but half the fun for the Birthday gal is to have a Barbie to play with when the cake is all gone. There is a line of ballerina Barbies that sell for 5 – 10 dollars. I find these work great because Barbie has a plastic bodysuit that is attached so there is no need to pipe a bodice with icing. 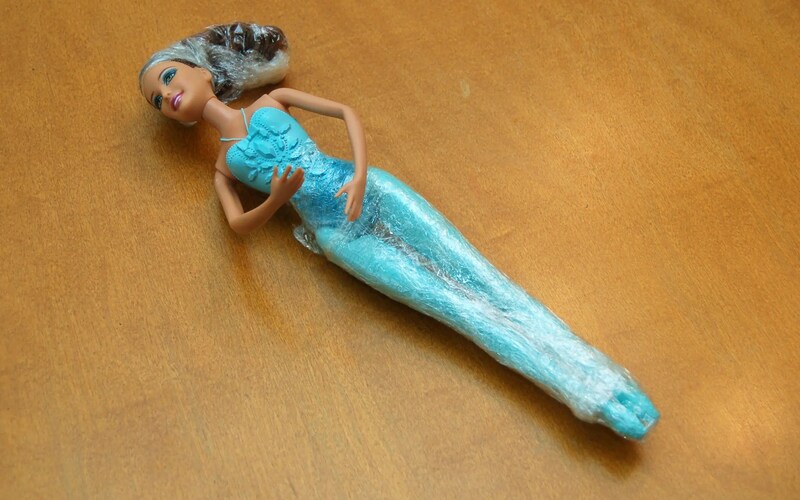 Wrap your Barbie’s hair and legs in plastic wrap to protect it from the frosting process. 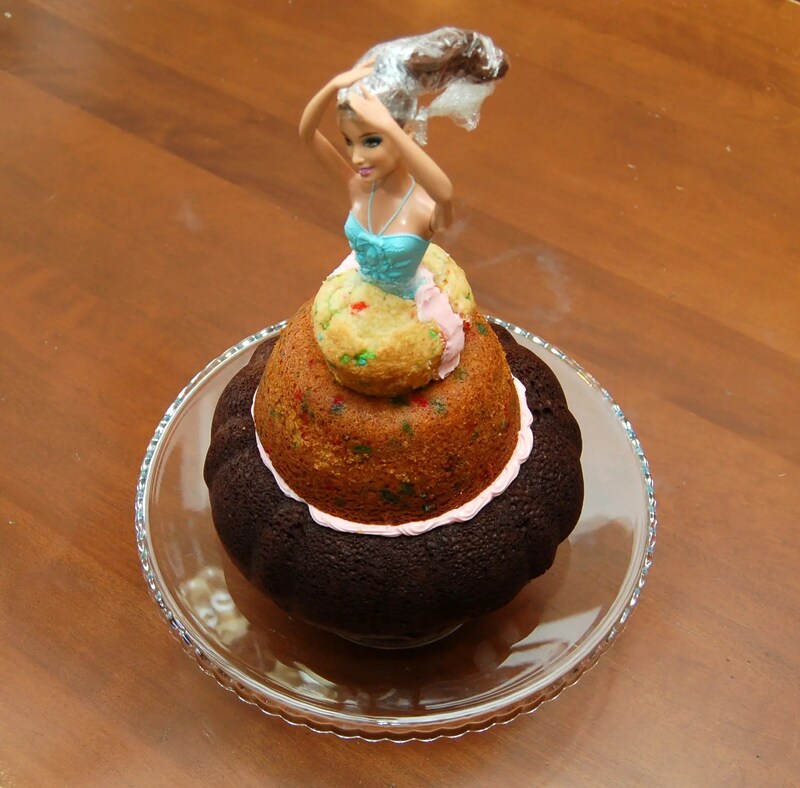 There is no need to go out and buy the special Barbie cake pans. I use three types of cake pans to make this cake. 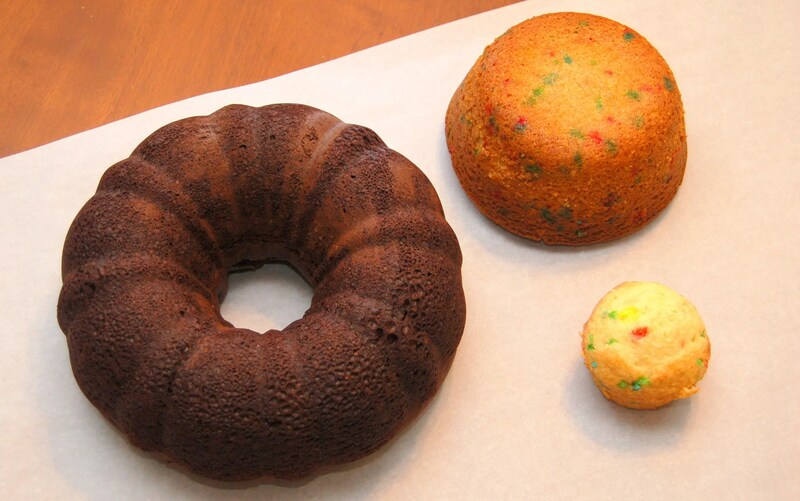 For the bottom I use a bundt pan, for the middle I use a heat-proof pyrex bowl, and for the top layer I use a cupcake. I use a generous application of Pam on each “pan”, if you don’t like using Pam, just be sure to grease and flour each pan thoroughly. To keep things simple I use cake mixes. You will need 2. One for the bundt pan, and the other for the heat-proof bowl. Use the remaining batter to make cupcakes. You should get about 4 – 6 cupcakes. I usually bake the cakes the day before just so the cakes firm up a bit before you try to frost. Cream the butter and cheese. Add the sugar and vanilla extract. 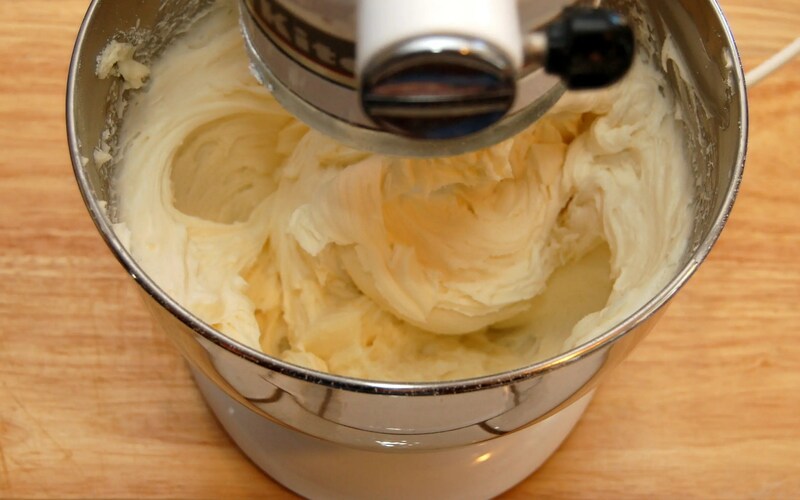 Whip for 2- 3 minutes in your Kitchen Aid mixer. Or if you don’t have a KA whip until very fluffy. Add the food coloring one drop at a time until you have the desired color. 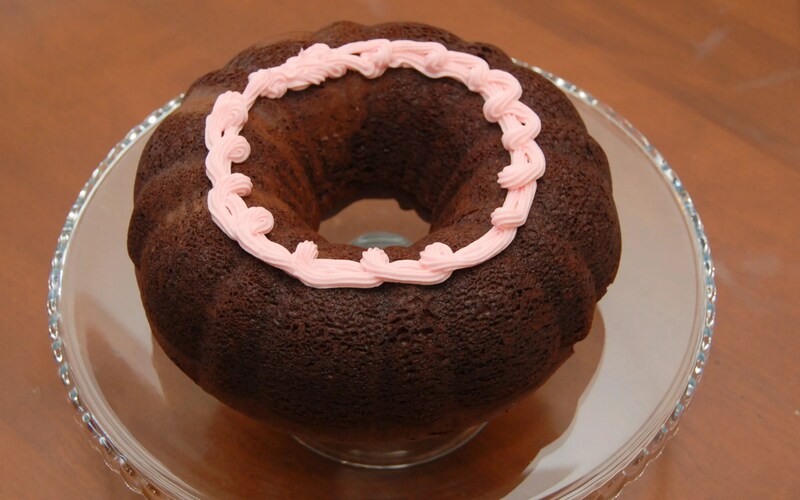 Now to start put a little frosting on your cake dish to “glue” your cake to the dish. Add a little frosting to “glue” the bottom cake to the middle cake. Now you’re going to shoot me. As I was making this cake I forgot to take a picture of cutting a hole in the middle cake just big enough to fit Barbie’s legs. I promise I will update this part as soon as I make another cake. Now Barbie is ready for her crumb coat of frosting. A crumb coat is just a light layer of frosting over the entire cake. This helps to keep the crumbs from getting into your finished frosting as well as hold the cake together. You’ll notice in the picture that I put some parchment paper around the bottom of the cake to keep the cake plate from getting dirty as you frost. 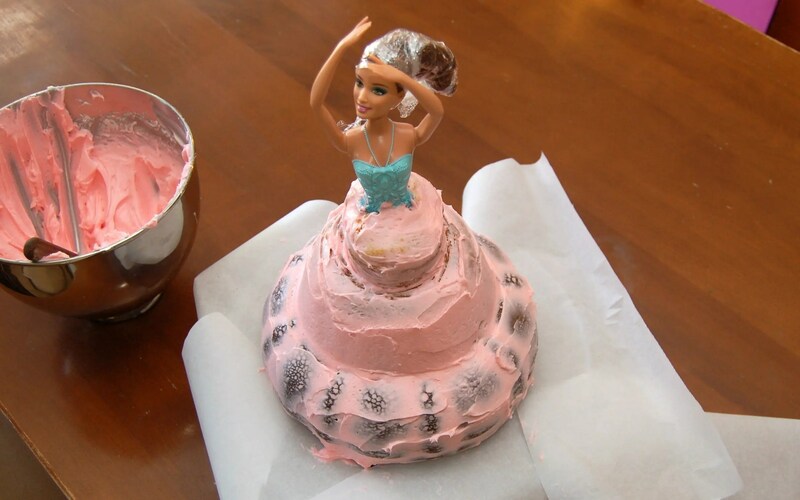 Once your crumb coat is finished put Barbie in the fridge for about an hour to firm up the frosting. Now comes the tedious part. 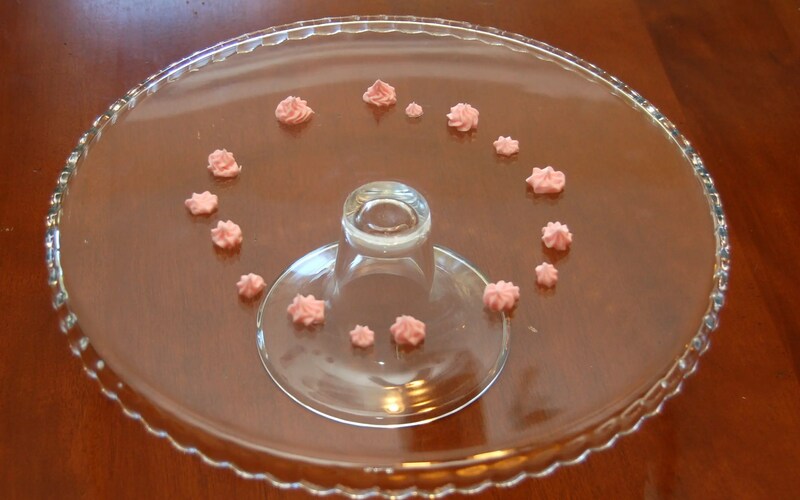 You will use a frosting bag with a star tip to make little stars all over Barbie’s skirt. 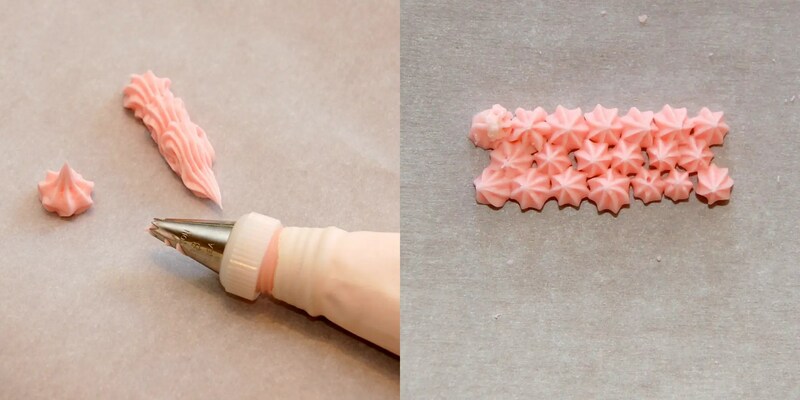 Using the star tip is the most forgiving of all frosting methods. Practice a couple of times on a piece of paper. Then go for it! You will start at the top and work all the way around Barbie’s skirt before starting the next row. Offset the stars between the rows like I have here and you will get better coverage. Don’t worry about your stars being exactly the same I promise it will all blend together for the finished product. 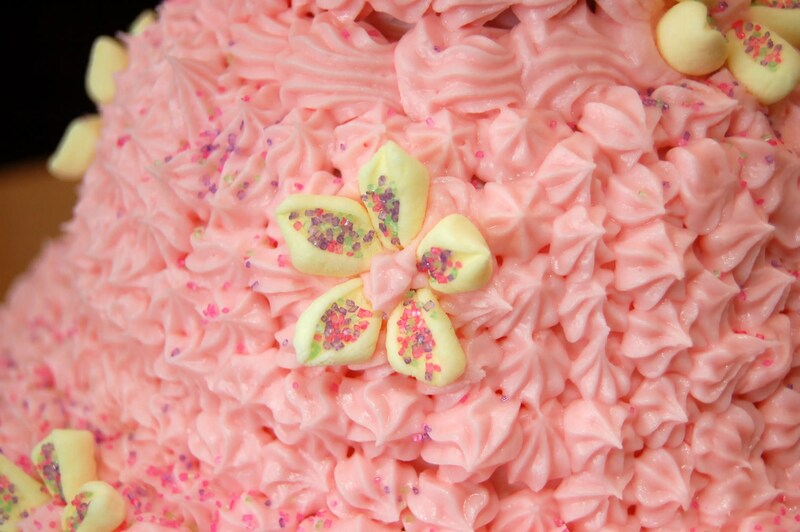 To finish off the skirt, add some of these simple Marshmallow Flowers. You make these by simply cutting a mini marshmallow in half diagonally. 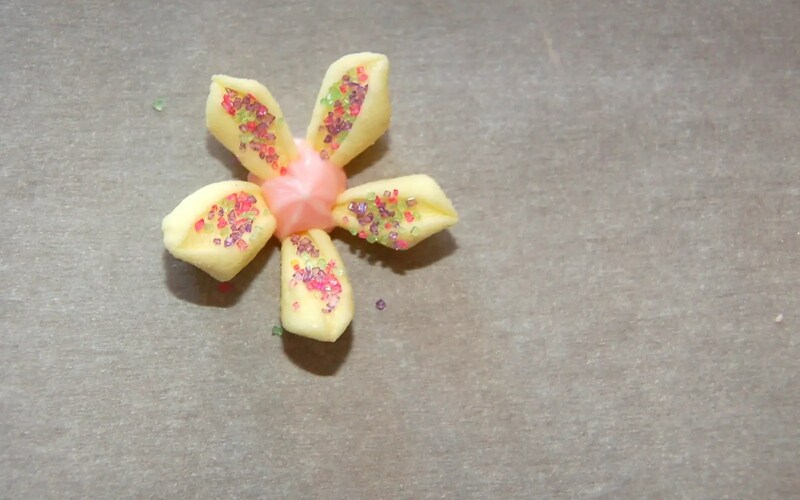 Dip the sticky cut part into some colored sugar and press into the frosting on Barbie’s skirt to form a flower. I also sprinkled the colored sugar directly on Barbie’s skirt for a little extra color. There you have it! 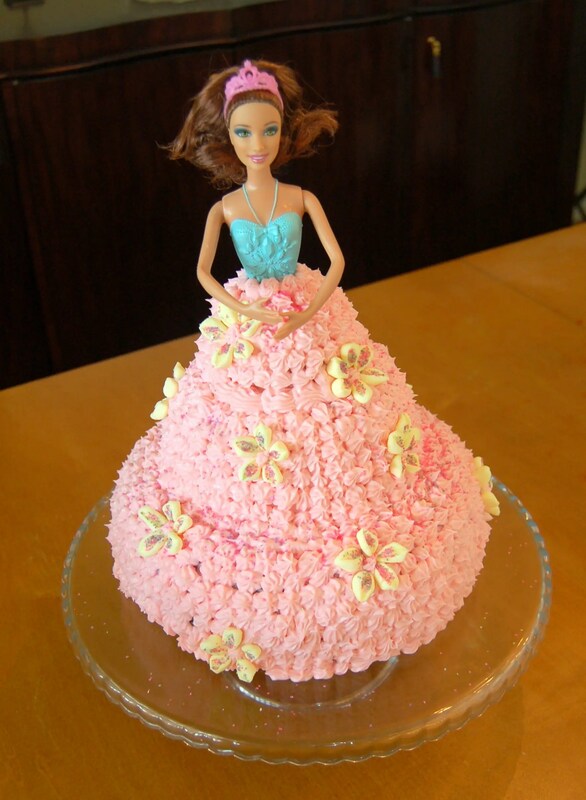 A fabulous, SIMPLE Barbie Cake to delight the Barbie lover in your life! Enjoy! Questions? Leave them in the comment section and I will answer as soon as possible! Your cake is adorable ! It brings back happy memories\s of the Barbie cake my Aunt made for me every year . Your post made me think about how happy that make me every year . I have 3 little nieces that I am going to start making your SIMPLE Barbie Cake for ! Good Memories! Little did your Aunt know that she wasn’t just baking a cake she was baking memories! Are you asking how much for the cake? I don’t make them to sell. Materials would cost about 20 bucks plus the price of the doll to make it yourself. What size star tip did you use?